Let your child know that he is a priority to you. Most rebellion has it’s root in hurt and bitterness caused by unfulfilled promises, the feeling of being unimportant or undervalued, divorce etc. Telling isn’t enough, it’s a start, but not enough. The only way you show your child that they are a priority is by an investment of yourself and your time. The short time that you have with your children can never be relived. Believe me, if you’re a young parent it goes so fast that before you know it you’re sitting at their graduation wondering where the time went? Don’t make these thoughts ones of regret. Invest wisely. Invest in your children’s lives, you’ll never regret it. I would never encourage anyone to be a poor housekeeper, but I will never forget something a friend of mine once told me. “Your children won’t remember what the house looked like, but they will remember the time that you spent with them.” Please keep this statement in balance. If your home looks like the city dump and your children are ashamed to bring their friends home, get out that shovel and get busy because our homes are supposed to be a haven for our families. But if no one is allowed to sit on the furniture, ask God to forgive you for your misplaced values and loosen up a little. I remember when I was growing up, we had two chairs in our front room that no one, except company could sit in. I’d say, “Mom, why do you have chairs if you can’t sit in them?” I didn’t grow up in a home, I grew up in a museum. The rules of the house were don’t touch, don’t sit, don’t breathe. We had a beautiful house, but it wasn’t a home. Keep your priorities straight, keep first things first. Your priorities should be: God, your spouse, your children, then your career and down the line. Anything else is out of balance. When things are out of balance life doesn’t work well. Think of your tires when they are out of balance, they can make a 3,000 pound car shimmy and shake. Keep your family in spiritual balance, you’ll avoid the pitfalls and traps the enemy is trying to set for you and your family. Make it a habit to tell your kids you love and believe in them often. Then follow up your words with the undeniable proof . . . your time. Again, our priorities should be: God, spouse, kids, then everything else. Anything else is out of order. You teach your kids about marriage by how you treat your spouse. Treat your spouse like you would would want to see your kids treating their spouses. It’s the biggest favor that you can ever do for them. You will spend the rest of your life with your spouse. Your kids will only be in your home for a few years. Don’t build your life around your kids exclusively or you’ll find yourself staring at a stranger when the nest is empty. Date your spouse for the rest of your life. Make your priority a healthy family. 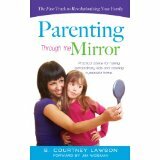 Excerpt from “Parenting Through the Mirror” to be released later this year. Isn’t it strange how you think you have parenting nailed down with your first child, and then another child comes along and breaks all the rules you thought you had figured out? Little Johnny is confident, then along comes little Mary, and you’d think you beat her daily. She has no self esteem at all. Our first-born had the energy of three kids, he was born angry because he couldn’t walk and he worked insistently toward mobility until he literally ran at nine months. I have a picture of him at just a few weeks old with his head up looking over the edge of his basinet. At least his eager persistence got me wall to wall carpeting. It was like making him a padded room so he wouldn’t kill himself. He was the textbook strong-willed child. He knew what he wanted and look out if you got in between him and his goal. Then our daughter came along and if you even indicated that you might be even slightly displeased with what she had done, she was crushed. If we had handled her in the same manner as our son, we would have destroyed her. Heather was disciplined to the max, detail oriented, don’t dare tell her it was three when it was three and a quarter. Then along came number three, and life was good for him, he was mister even keel, happy and stable. He rarely needed correction or discipline, but he needed motivation. So with every child we had to adjust our approach. Think of Jesus, He never dealt with two people in the same way. In Mark 8:32 we find Jesus healing a blind man by spitting in his eyes, shortly after that in Mark 10, he heals Bartimaeus by just saying “Your faith made you well.” In John 9, He makes mud with spit and dirt and puts it into the guys eyes and he is healed. Three men and three different solutions to the same problem. If Jesus wasn’t married to cutter cutter techniques we shouldn’t be either. Our children are unique and special creations with individual giftings and callings. We need to treat each one as a rare and precious gift. “I will praise You, for I am fearfully and wonderfully made.” Psalm 139:14 We are also responsible before God to seek Him for direction for each of our children. And when we get stumped, who better to ask for advice than the Creator?